I've always coveted an Aston Martin. Whilst Bond was cool in a DB5 I didn't really get the clunky, boxy, Prince-Charles-beloved barges of the 1980's even though they were built just down the road from where I live, at Newport Pagnell. But when the latest Vantage came along - what a sweet car. And when they shoehorned in the V12...! Ferraris and most Italian marques, come to that, always seemed a little too "look at me" by comparison albeit the pic on my old Top Trumps (a flattering pic of a red Ferrari 365 GT BB against some rocky desert backdrop) did stir. 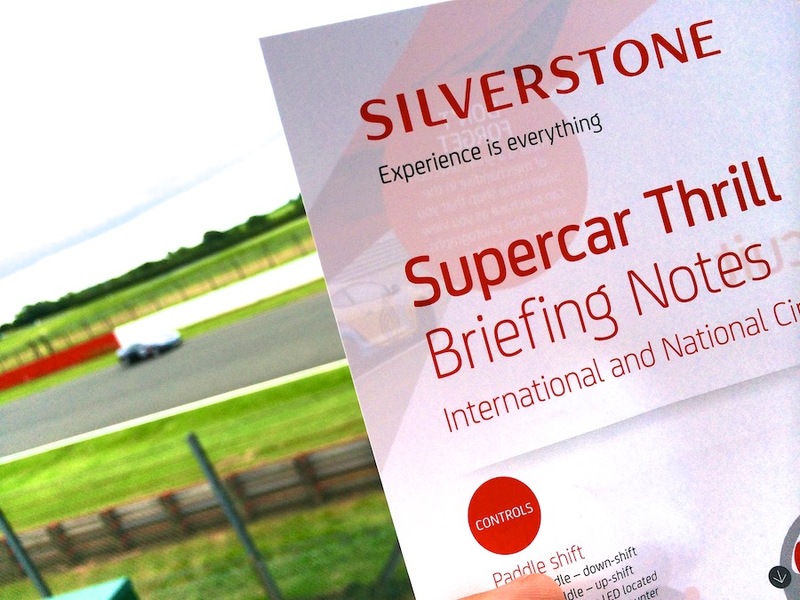 So with a hatful of preconceptions and little (no) experience of actually driving the things, I set off to Silverstone "The Home of British Racing" to cash in an Experience Day voucher driving these marques back-to-back in anger. First up was the Ferrari 430 - a flappy paddle-shift beastie. I've not driven this way before, so the combination of this, a low cabin, roll-cage, helmet and a guy right next to me telling me to do things counter-intuitively didn't really enable me to capture the "spirit" of driving an Italian Stallion over the few laps you get. The experience was all a bit too mechanical and as for the car I was really surprised at how sluggish the up-shifts were. Bapping down the Hanger Straight and hoping for some rifle-shot shift just didn't happen. More of a click-pause-bump with too much a drop in revs, not the scream your expecting from a Ferrari. Perhaps with a couple more hours to get the feel of the 'box and where to find the limits would have helped. Possibly. The other problem with a way-sorted chassis and grippy rubber is that unless you're feeling the edge, it's just a bit..er, "boring" on such a large wide road. Next up was the Aston. With a manual box. Yes! With the benefit of having had a few sighting laps in the Ferrari and one less new element to think about, off we went. What a sound. My instructor this time was a little more supportive to me "pressing on" as he could tell I had no problem in using my right foot, sighting apexes and could drive quick. This was waaay better and I actually felt I was in tune with the car and making the most of the track (50% of the famous F1 circuit), finding the lines and using the car fully to improve my progress. Amazing. So, on aesthetics and theory (which most of us only really ever judge supercars and hypercars on - unless you work for EVO magazine or Top Gear, or are minted) I would have chosen the Aston Martin. After driving them, albeit briefly in unnatural surroundings, I would stick with the Vantage if someone forced me to have one. Whether this was the order of driving, the unfamiliarity of paddle-shift or a genuine preference I don't know, it was only a taster, but it looked, felt and sounded right. Back in the real world, the family and I climbed up into our Toyota RAV4. Not quite the same but it does its job perfectly. That said I'm lucky to drive a Nissan 350Z GT Roadster I enjoy every single mile even now. It's a keeper. Perhaps because the more you get used to something the more it feels part of you. It's not lavish by any means and very much an old-skool, front-engined, real-wheel drive thing with a strong engine and a communicative chassis. And with the roof down you can't beat it for the money. It looks the biz and feels special, to me anyway. "a rich man is one who knows he has enough"
A little dreaming is not a bad thing. Within my photography world I love observing the detail in well designed objects that have purpose and beauty, especially cars - lines, curves, shapes, badges and wheels have a particular fascination. I use these elements to inspire some of my abstract artwork "artAuto" such as this Aston Martin One-77 wheel.